In the Press, and will be shortly published. A FULL REPORT of the Proceedings at the Public Meeting of the 2nd Aug. 1834, to which, is appended a detailed Account of the estimated Expenditure for 1834 -in a neat quarto demy Pamphlet. The great importance of this Publication, comprising such extensive local information, it is presumed, will be an inducement to every Colonist, to possess himself of a copy or copies, for his own library, or to be transmitted to his friends in England. It is the bounden duty of every well-wisher to the Colony, who may have friends in Parliament, to furnish the latter with the best possible information for their guidance in any Debates that may arise on this subject. The True Colonist was Gilbert Robertson’s paper and it was printed at Bent’s office. Robertson’s reporter, J. D. Campbell, had previously worked with E. S. Hall at the Monitor in Sydney. Bent probably did the printing in stages as further articles (mostly presented as ‘Hints to Mr. Hume’) appeared in the newspaper and were added to the pamphlet, using the type which had already been set up in columns of brevier. Publication was announced in the True Colonist on 23 January, price 2s. 6d. 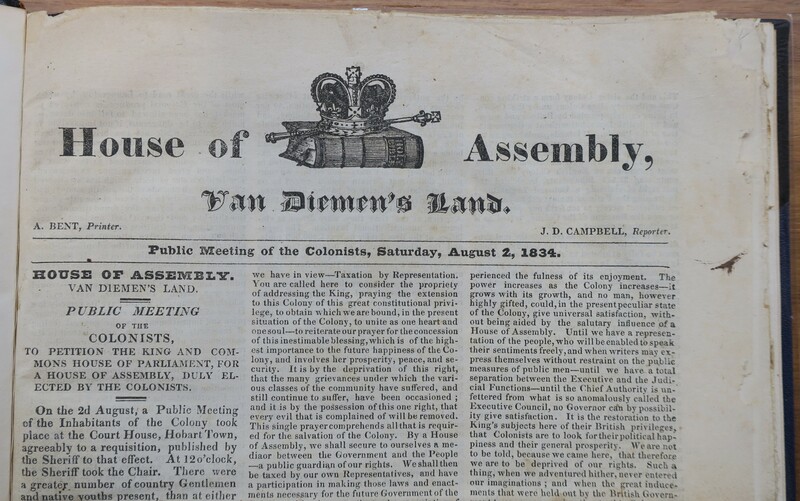 We have been favoured with a copy of Mr. Bent‘s pamphlet, containing an ample report of the proceedings, at the public meeting held at Hobart Town in August last, to petition for a Representative Assembly at Van Diemen’s Land. It is very creditable to the Compiler and Printer, and cannot fail to be of great service, if extensively circulated in England. We have sent home … fifty copies of this pamphlet to various Members of Parliament and we would recommend it to every settler in the Colony, to have a copy, of it, bound and preserved in his family archives; it will be an interesting matter of reference some twenty years hence, and doubly so when the present generation hath passed, away. We are sorry to learn that Mr. Bent, has not sold as many copies as will pay for the paper on which they are printed; although he has given away many copies gratuitously, to persons going or sending to England. Ferguson notes that his copy belonged to John Pascoe Fawkner, and that one of the Crowther copies belonged to Crowther’s grandfather, who was probably present at the meeting.